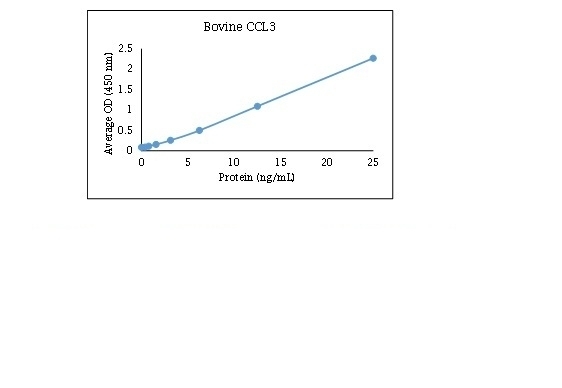 Recombinant Bovine MIP-1 alpha , also known as CCL3, is a recombinant protein corresponding to the 24 -93 amino acid sequence of native bovine MIP-1 alpha. MIP-1 alpha, belonging to the CC chemokine family, plays a critical role in hematopoiesis and is shown to signal through the chemokine receptors CCR1, CCR4 and CCR5. MIP-1 alpha is also involved in host defence against invading pathogens, acting as a regulator of activation and trafficking of inflammatory cells, such as macrophages, NK cells, granulocytes, dendritic cells and T-cells.